Karen Tait is a microbial ecologist at the Plymouth Marine Laboratory. 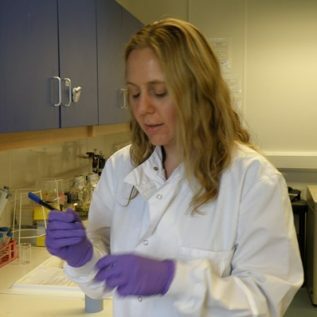 Karen uses molecular biology techniques to explore the relationship between microbial communities and biogeochemical cycling within sediments, with a particular emphasis on nitrogen cycling. This has comprised studies of the effect of climate change including ocean warming and acidification on microbial communities (including in the Arctic), benthic responses to plankton blooms and the interaction between bioturbating infauna, microbial activity and biogeochemical cycling. Within the ChAOS project, Karen will be working with the team of microbiologists to characterise benthic microbial community structure and nutrient cycling activity under contrasting regions of sea ice cover.